Our two powerful night club bubble machines will produce thousands of ultra violet bubbles that will glow purple as they romantically fall onto your dance floor. We will operate the machine periodically throughout the night to produce a magical effect. 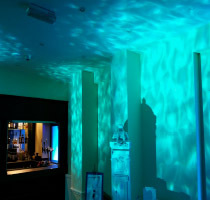 Light the outside of your venue in an array of stunning colours… Create the wow factor and impress your guests. 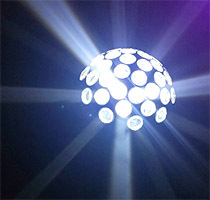 Create a stunning LED mirrorball effect on the ceiling above your dancefloor or across your entire function room or marquee. Great for creating a romantic atmosphere at a Wedding Reception. Looks amazing for the 1st Dance & throughout the evening… Larger venues may require 4 -8 units for total coverage. Our new water ripple lighting projectors create a realistic moving water effect when positioned on any bright coloured surface such as the white walls of a marquee. This unit can run throughout the length of your disco creating an amazing special effect or used in conjunction with our Fire projectors why not have a Fire and Ice theme as a chill out area for your guests; how cool is that! Visit our studio to see a demonstration of this system. 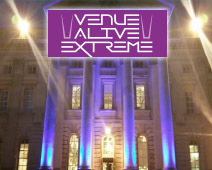 Whether your venue is traditional or modern our digitally controlled LED lighting will as the name suggests; bring YOUR venue ALIVE! These individual lighting units can be positioned as pictured to light balconies, statues, fireplaces, pictures or walls. Their application is endless. This technology will allow us to quickly change the appearance of your venue in a cost effective manner. Great, if you have a colour theme! Simply measure what area you would like covered, decide upon the spacing between the fixtures and you can work out how many fixtures you will need and how much it will cost. 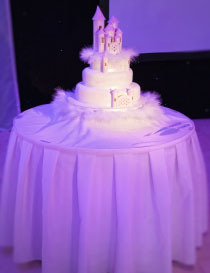 Show off your Wedding Cake by elegantly lighting the cake table and the cake itself! A great addition to your Wedding, our Illuminated LOVE letters stand at either one foot tall or four foot tall. 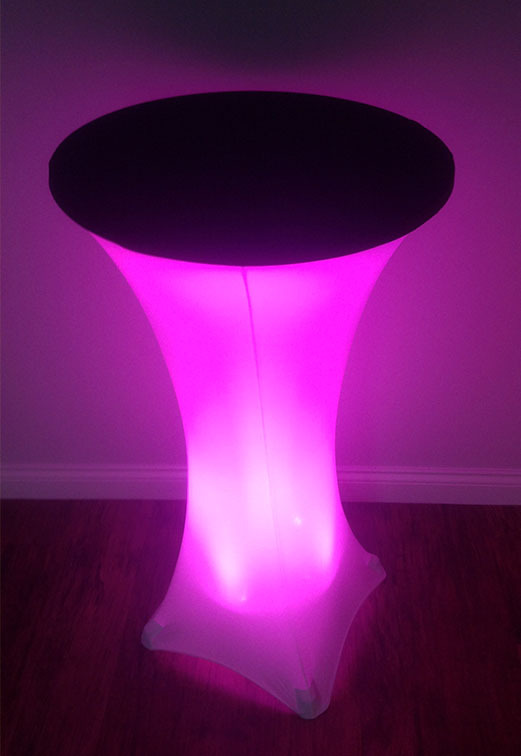 They can be illuminated in your colour theme or multiple colours and are priced very competitively at just £199. 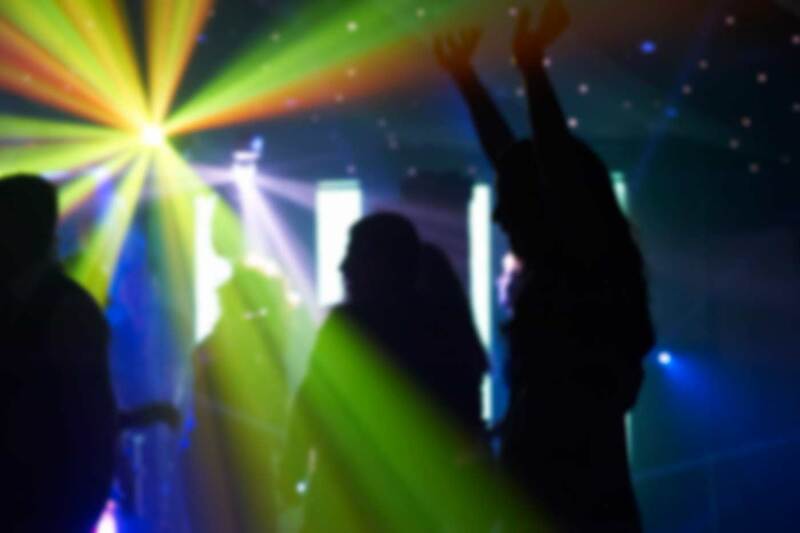 Providing that you have Booked the All-Inclusive Wedding Disco Package with Equinox-Storm we also offer our Wedding Ceremony Package to add that professional touch to your civil ceremony. We will provide a discreet Bose sound system to stream background music during the seating of the guests, we will liaise with your registrar on the day and control the arrival of bride music, signing of the register music, exit of the Bride & Groom music, exit of the guests music. We will also spotlight the Bride as she walks down the aisle. This package will add a touch of class to your civil ceremony and take away all of the worries that normally go with hosting the civil ceremony music. 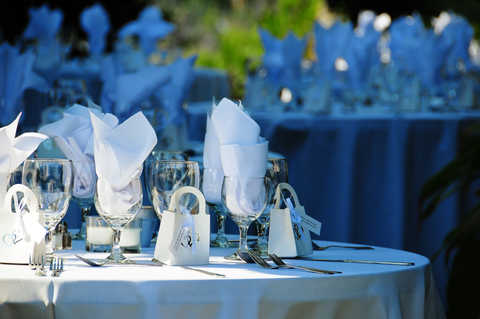 We would recommend about 6 tables to create an impact, but you can have as many or as few as you wish…. Just as seen on TV! You can ‘dance on a cloud’ for your first dance. Unlike most disco companies, we use Dry Ice. This is the real deal, chilled at -78.6°C our fog will hug the dance floor and will not rise above your knees! This effect looks absolutely amazing and will not affect any venues smoke detectors!! Creates a fabulous 1st dance picture. Our new flame lighting projectors create a realistic flame effect when positioned on any bright coloured surface such as the white walls of a marquee or the bar area. This special effect can run throughout the length of your disco to create a visual inferno on your dance floor or used in conjunction with our Water projectors why not have a Fire and Ice theme as a chill out area for your guests; how cool is that! 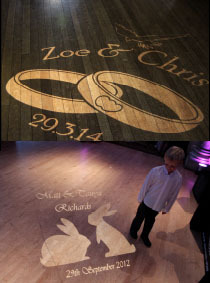 The Logo Projector can project the names of the Bride & Groom, your initials, wedding date and/or graphics (see pictures). You can select your design from an extensive collection to produce a custom gobo for Equinox-Storm to project your chosen image onto the dance floor, ceiling or wall of your venue. The projection can be static or can slowly rotate. Each unit can project only one logo or message at a time. Personalise your function! Have your name in lights!! A real classy touch for your celebration. 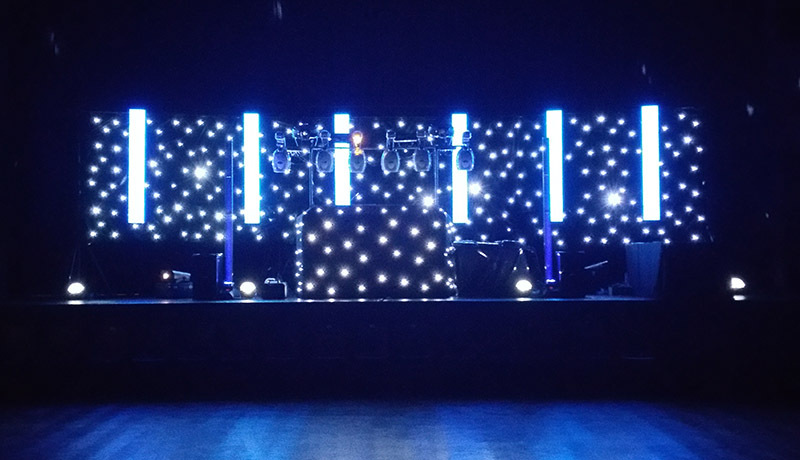 Fixed to a trussing support frame these impressive high powered, superbright LED panels act as a backdrop to your DJ to create an upmarket feel to your celebration. Earlier on in the day/evening they can be set as a fixed mood lighting feature (great if you have got a colour theme) and then when the party gets going they can become a syncronised bargraph/equalizer type lightshow. Your guests will be talking about these for months…..
Visit our studio for a demonstration!. Modern & Impressive, You won’t be disappointed! We would recommend positioning 8 of these panels in front of a 6 meter starcloth; the result is visually stunning! 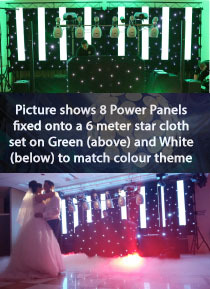 Without doubt, the Venue Power Panels will create a fantastic backdrop to your disco that will take your celebration to a new dimension. On a budget?? Then why not put 6 Panels on your 3 meter starcloth included in your package! You Decide!! If you are looking for a true nightclub feel to your function then this is the ultimate upgrade option for you! Standing on Aluminium Trussing podiums (uplit to match your colour theme) & using ultra smooth, micro stepping motors our 4 Professional moving heads literally Pan 540° and Tilt a further 270° putting everybody on YOUR dance floor in 360° club style action. Fully controlled by our road crew team, our moving heads have the capability to help create a nightclub atmosphere using some of the latest technology. These power packed lights will project 14 shapes and patterns and come equipped with the new gobo shaking effect. Used in conjunction with our haze machine that is already included in your all-inclusive package this upgrade is sure to wow your guests…. Please Note – Long Head Tables may require 2 or 3 lights. Round tables will only require 1 light. Mesmerise your guests with our new snow machines that are controlled by our roadcrew team to generate anything from a slow picturesque snowfall to an Ibiza foam party on your dancefloor. This is a true wow factor and is worth every penny especially when used with our venue power panels. With this service you can arrange for us to set-up our equipment at any time prior to our standard arrival times (normally 90 minutes before your contracted start time). This may be useful if the entertainment is going to be in the same room as the Wedding Breakfast or if your function is being held in a Marquee. You wouldn’t want us to arrive as you are just about to do the speeches! This service is becoming very popular. Animations include amongst many others a walking cat, running dinosaur, galloping horse, dancing Aztec character and a flying bird. The aerial patterns beamed through the air include circles, waves and flat lines. A real show stopper! 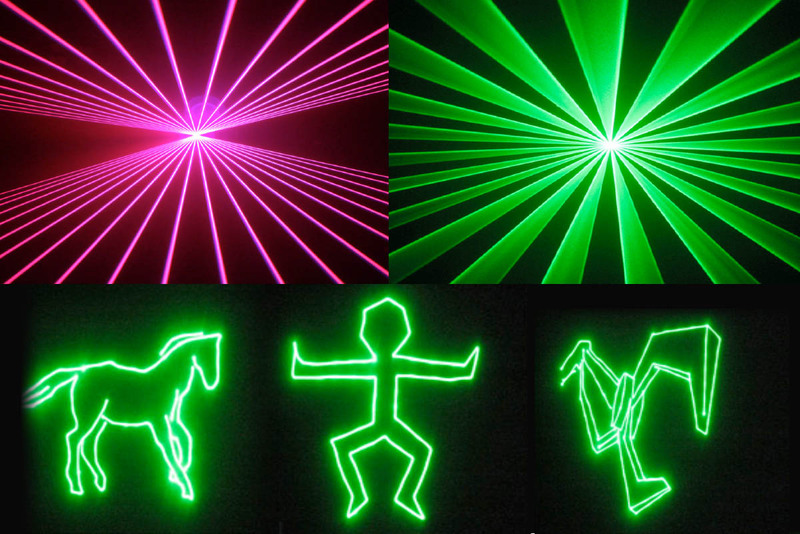 Our Animated Laser Show will amaze you & your guests. 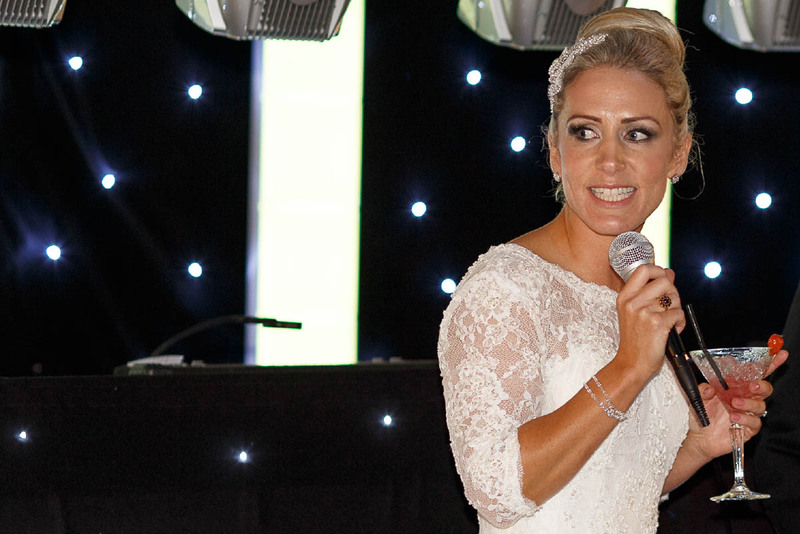 With a range of up to 50 meters, we are offering our radio microphone that can be used anywhere in your venue to accommodate any announcements or speeches prior to your DJ arriving. Silk Flames – Match Your Colour Theme!! Standing at 1.5meters tall our stunning Silk Flame effects will create a sophisticated atmosphere throughout the evening. 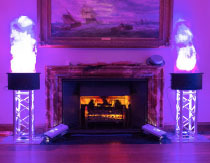 The Flames can be programmed to match your colour theme and will look great at the entrance to your party, on stage with your DJ or either side of a feature or maybe the buffet table? Usually only seen on TV, now you can have these amazing effects at your function. 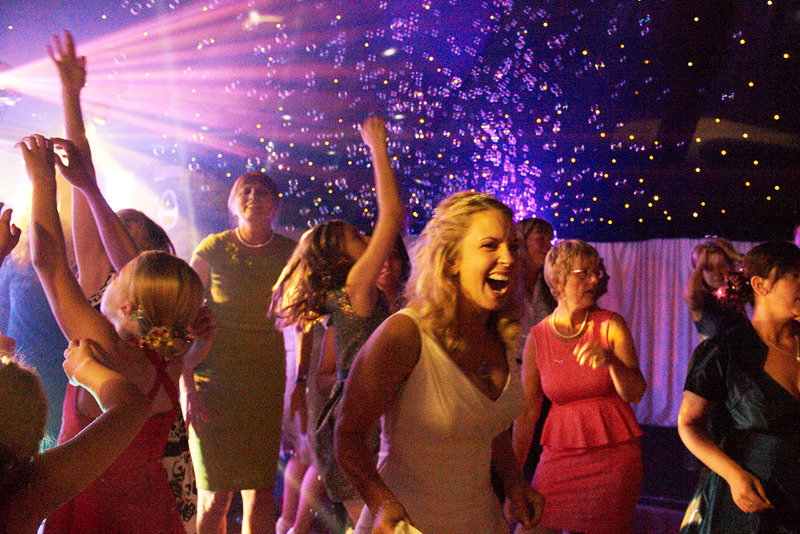 Our Professional compressed air charged cannons will silently disperse a striking aerial effect of ‘slow fall‘ confetti over your dance floor. This is an amazing effect when fired at exactly the right time to create a perfect moment. 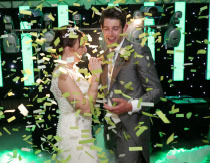 See our website for our confetti options. Match YOUR colour theme! Your all-inclusive package already comes equipped with the 3 meter version of the star cloth, but the 6 meter really does put a whole new light on the evening! 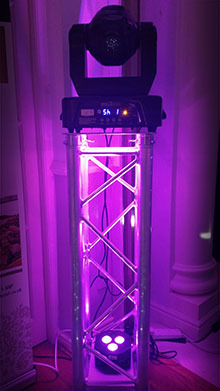 This is a true wow factor and is worth every penny especially when used with our venue power panels. Why not create an Oscar Style entrance using our drapery & slik flames – Transform your function room beyond recognition- stunning! Maximum height of drapery is 3 metres tall. £23 per metre. 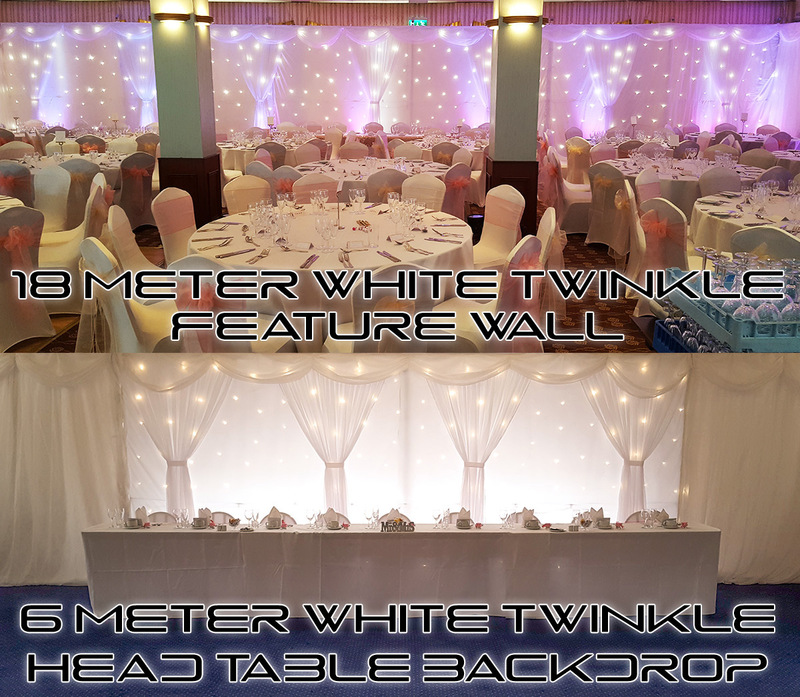 Enquire about our amazing NEW White Twinkle Head Table Backdrop. Add a touch of class to your Head Table creating a stunning focal point and picture perfect backdrop. The backdrop can run either 6 meters or 12 meters wide and up to 3 meters tall. 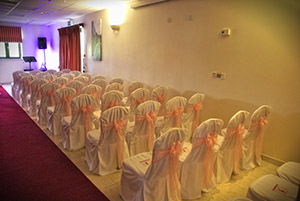 ON A BUDGET BUT WANT TO TRANSFORM YOUR VENUE? Why not use our White Twinkle backdrop to make a Feature wall – truly stunning! Cover an entire wall end to end up to 18 meters wide! 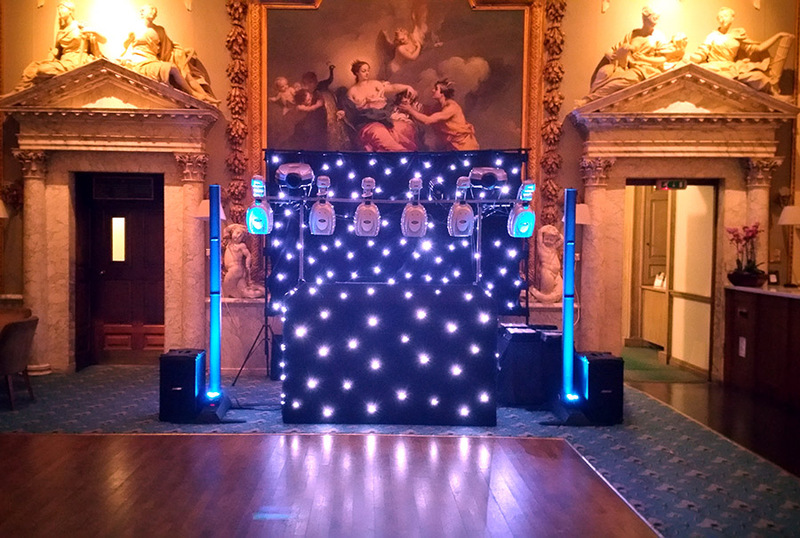 Our vertical mist machines are guaranteed to give you that X Factor CO2 gas effect look, providing a true wow factor for your guests adding a new dimension to the dance floor later on in the evening…. Our mist machines will simultaneously launch fog in a vertical jet up to 15 feet in the air. The fog will then disperse and help to enhance your lightshow. Please find below some ideas on how with Equinox you can build your disco to match your budget and colour theme! Here are some ‘real’ examples that our clients have booked and have worked very well. With Equinox-Storm you can choose all of your music in advance of your function in the comfort of your own home. Upon booking we will provide you with a password to gain access to this function. Mr & Mrs Quiz Game- How well do you really know each other?